We love this early part of the Take the Lake season, where dreams grow big and we don’t have to worry quite so much about the details. Take the Lake 2011 has appeared at the CoCo Youth & Families Assn. Tips Dinner Feb. 26, and the CoCo Dept. of Aging Health Expo March 3. We’re showing off the 2011 “Military” theme with plenty of red, white and blue. Both events were very appropriate for Take the Lake, as the Tips dinner not only had a patriotic theme this year, but is all about families and fitness – just like TTL. We have found that many seniors participate in TTL (our largest age group in 2010 was 40-60 years old), so we think we were a welcome sight at the senior’s health expo. We spoke at the Optimist and the Kiwanis clubs and the Whiteville United Methodist Church men’s group in the past few months, and are set to speak to the Lake Waccamaw Women’s Club March 21. We’d love to speak to your club or group about this inspiring event that can motivate your members and their families and friends to adopt or maintain more healthy lifestyles. Please contact Mark Gilchrist at The News Reporter, at 642-4104 ext. 241 or by email. The start of the 2010 Take the Lake Paddle Personal Endurance Challenge.101 paddlers finished the 14-mile event. The Take the Lake organizational committee announced the theme of the 2011 Take the Lake season recently, setting up a good fight for the upcoming months and summer. Take the Lake will celebrate its third official year as a fitness event on and around Lake Waccamaw in September. With nearly 900 participants having taken part in 2010, organizers are expecting to easily break the 1,000 mark this Labor Day weekend. Take the Lake began as a pilot event in 2007 and fully in 2008 as expansion of the traditional Labor Day Swim and the decade-old walk around the lake. The first challenge, or PEC, is the 15-mile Walk/Run on Saturday morning, followed by the 14-mile paddle and the 15-mile Bike & Hike on Sunday, and the four-mile swim on Monday. The event is free, and every successful participant will receive a small award commemorating their achievement. Themes are being adopted, beginning this year, for two purposes. First, they will give each year a fresh and exciting atmosphere, and second, they will help the event target specific groups and members of the community. The term “take the lake” is borrowed from military jargon. When an army “takes” a hill or fort or city, they surround and capture it. All of the Take the Lake Personal Endurance Challenges require participants either to walk, run, cycle or paddle around Lake Waccamaw, or to swim completely across it. Having done so, a participant can feel as though he or she has “taken” the lake. So, it is fitting that the first theme chosen to represent Take the Lake is military, and service to our country will flavor all promotional materials surrounding the event this year. This will not in any way limit participation to servicemen or veterans, but will, in fact, give everyone the pleasure of celebrating them. Organizers will use this theme in their “fight” for fitness in two ways. First, they will contact active-duty members of the armed forces from area installations and encourage them to dispatch troops here Labor Day weekend to participate. 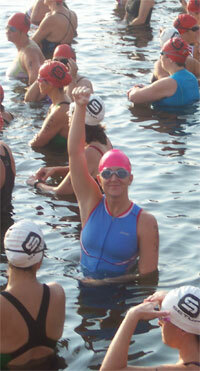 Heading out from the south end of the lake, 39 swimmers stroked four miles from the dam to Johnny's pier. They will also work with Sheri Blackmon of Columbus County Veterans Services to encourage the more than 4,000 area veterans to participate. This two-pronged attack should empower the active-duty servicemen and women to encourage the veterans, and should find the veterans inspiring servicemen. Military veterans and their families in rural areas throughout the country, and in Columbus County in particular, are not given the same fitness opportunities as those in metropolitan areas. We have no V.A. hospital here, and no installation where veterans can easily partake of fitness equipment, programs or training that is available to those near cities. This robs them of a healthful environment where fitness is more a way of life. Getting ready for the start of the 2010 Bike & Hike Personal Endurance Challenge, which 447 riders finished. The shame of this comes from the well-known fact that the majority of our nation’s fighting force is recruited from small towns. A goal of Take the Lake this year will be to give our veterans exciting challenges that will motivate them to experience fitness goals they were used to while on active duty, and the rest of Columbus County will be recruited to assist. Sign up for Take the Lake to show appreciation for the sacrifice veterans gave to preserve our freedoms. People can walk or cycle, paddle or swim in the name of their favorite veteran, or just to celebrate their freedom to live healthy lifestyles. Residents of the Lake with homes on the route are encouraged to show their pride on and around Labor Day weekend with flags, banners, streamers, posters and whatever delivers the message that we are proud of our country and our servicemen. Several groups will be invited to represent specific service branches, and even host active-duty men and women if the opportunity arises. More information can be found at Takethelake.org. The website reflects the successes of the 2010 event and will be retrofitted for 2011 early this spring. In what will surely make Take the Lake even more exciting beginning this year, we will start adding themes to each year’s event. This will make each year unique and will better enable us to target specific groups, one at a time. Wondering what the theme will be for 2011? You’re not alone, and we have taken advantage of a unique opportunity to unveil the theme later this month. TTL committee member Mark Gilchrist has been restoring a Whiteville landmark for several years, and he is nearly finished converting the former Whiteville Womens Club into a (his) private residence. To allow everyone who has ever visited the building the opportunity to see it in its new form, Mark will hold an open house / housewarming / Take the Lake party. Lake Waccamaw and Whiteville residents got a touch of summer fun in December as the Take the Lake team paraded through town for their Christmas parades. At the Lake, the crew of Eric Brandt, Grant Egley, Stuart High, Lundy Lytton, Caitlyn Andrews and Eden Kissam braved stiff winds and brisk temperatures carrying a 40-foot-long banner. They walked, of course, ignored children’s pleas for candy and offered up Personal Endurance Challenges for all to accept. 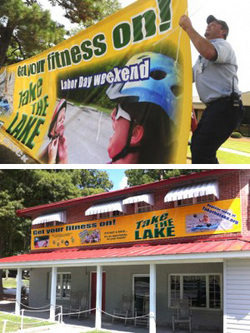 The next day, Stuart and Mark Gilchrist took it easy in Whiteville showing off a smaller banner, keeping Take the Lake and fitness on the minds of people throughout Columbus County throughout the year. Depending on how you look at it, retired Marine Brett Gore either gave me a good spanking, or a great opportunity. He humiliated me, or he humbled and challenged me one fine day this past August. I’m talking about the day, on the weekend before Take the Lake, that Gore and I cycled, paddled and walked around Lake Waccamaw and swam across it. This all began a year earlier when Russell Smith, a man much younger than us and obviously in better physical shape, completed all four of the Take the Lake Personal Endurance Challenges in a single day, which was just the right bait for our male egos. We set out to see for ourselves how it could be done, and if a one-day “extreme” challenge could become another event for Take the Lake next year. Over the summer, I prepared for the 15-mile walk and bike ride, the 14-mile paddle, and the four-mile swim the best way I knew how; I bragged about it to so many people that I just couldn’t back out on August 28. To the point, there was not a single moment that entire day that I was ahead of Brett. We weren’t racing, mind you, but it was just that way. We were alongside each other often, but I was never the lead dog, and my view never really changed. The paddle was the worst, and more than once I wanted to just walk up to the road and hitch a ride home. My view never changed all the way across the lake as I saw Brett’s safety boat yards ahead of me. It never changed around the lake as his steady and unrelenting paddling was like some kind of crazy outboard motor machine. All day long that was where he could have left me, in his wake, in his footprints, in his dust. He could have left me, and let me quit, of course, but that Marine just couldn’t leave anyone behind. The whole day was pretty embarrassing in a way, as I was constantly following behind this guy. Also, my brother and his wife watched me swim, and a fairly new girlfriend was around most of the day, always watching me following the lead dog. But, that was the beauty of the whole day for me. Sure, I was “second,” but I had success right in front of me the whole time, and I couldn’t let it down, I couldn’t give up – I couldn’t even slack. I had to achieve. Some people surround themselves with weaker friends so they are always the lead dog, but that will never inspire you to achieve the way being second with a taste of success will. Put someone on a team of slackers and performance will drop, but play on a team or work in an office with sharp, successful people and you will achieve your best. Put a child in a classroom of ne’er-do-wells, and by and large, that student will not succeed like in a normal class. If a child is brought up in a family with strong, considerate and successful parents, that child will likely grow up successful. We all know that, but yet thousands of children right around us live in broken homes, and somehow we expect them to achieve. To my credit, I at least had the common sense to feel pain, a quality I am sure my jarhead buddy lacked, because as we all know, Marines are just simply too thick-headed to understand complex subjects like pain and failure. I can say that because I’ve also said this: “Hey Brett, once a Marine, always a Marine, right? Well, I say, not a Marine, never a Marine.” And I said that through gasps of breath very loud, of course, because he was so far ahead of me. Had Brett left me, I might have quit, or finished sometime the next day, or week. But that Marine couldn’t leave me, and we did finish that day, 48 miles later, at 10:30 p.m.
I’m not sure Brett saw the beauty in the moment we approached his driveway at the finish of the walk, our fourth and final challenge of the day. His father Jackson Gore greeted us with his usual cheer, and we all felt pretty good. But I reveled in the joy of having been given a wonderful gift, the opportunity of having someone challenge and inspire me to not give up on the task and not give up on myself – he inspired me to succeed. We did succeed, and as I have told people since, if I had some kind of Top 10 list of achievements in my life, that beautiful day in August would be right up there. We can all grant that gift every day. Find someone you know who can use a little encouragement and lay it on them. Inspire them through your own actions and through your own success. Whether it be starting a group to Take the Lake, or to achieve in school, work or sports. Simply inspire them to not give up on themselves. We will offer Take the Lake Extreme next year, one weekend before Labor Day, and as much as I swore up and down in August that I would never do this again, I will do it again, and if I’m lucky, maybe I will inspire you to join us. Well, she is in the Top 10, at least. Lisa Richey’s pitch to “pay it forward” with SCC scholarships and support of Take the Lake not only passed muster with the judges in the Amway Positivity contest, but gathered enough online votes to reach the final round. From the hundreds of contest essays received, the judges had chosen Richey’s entry in late October to be one of 25 finalists ready for a popular vote. Visitors to the contest web site voted for a few weeks and did so enough times for Richey’s entry to at least place her in the top 10. 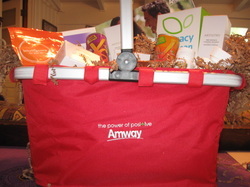 Amway will reveal the top winner during a John Tesh Christmas concert in Maryland in December. We are so pleased that Richey has chosen to support us and that she has positively spread the word about Take the Lake! Visit the contest web site. Click here to watch Lisa's video and vote to support Take the Lake! You think you voted? You haven’t voted yet… – Local (Lake Waccamaw) entrepreneur, philanthropist and all around positive person Lisa Richey has another admirable achievement; she made the short-list of a national competition. She entered the Power of Positivity contest last month, and among hundreds of entries, her video made the Top-25 cut with her appeal for Take the Lake and a local scholarchip program. Now, the contest for $10,000 turns into a popular vote. Yes, it’s another one of those “help us get a grant by visiting this site” pitches, but folks, this is a close race, and Lisa stands a very good chance of winning the 10Gs or one of 10 second prizes of $2,500 each – all of which she will donate to an SCC scholarship and Take the Lake. So please, visit the contest, and vote, vote, vote! You may vote once each day. T-SHIRTS - The extra shipment has arrived! They cost us twice as much as the first order, so we’ll have to charge $15. Please send your check as soon as possible to us, at: Take the Lake, C/O Julie Stocks, 2793 Waccamaw Shores Rd., Lake Waccamaw, NC 28450. Here is what arrived: 10 Smalls, 15 Mediums, 5 Larges, and 5 XLs. If you need shirts mailed to you, please add $5 per shipment to your order. Make the check payable to Take the Lake and specify your first and second size choices. Toss in an extra buck for an oval bumper sticker if you like – get these while they last! Thursday morning, The News Reporter hit the streets with many photos of Take the Lake, including a full-page spread in the Living section. Check it out, right here! At Take the Lake, our only goal is to give people a challenging goal, and encourage them to achieve it. That’s all. We don’t raise money for charities, we don’t hold races. We get juiced simply by watching people improve their fitness. You took the lake and got the award. Now you can help others. Do you have an inspirational story to tell? Or maybe just a cool way to express how awesome you felt when you finished? Please tell everyone by leaving a comment below. 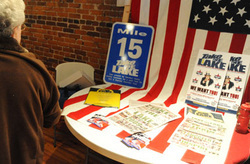 We’ll use these to encourage everyone for Take the Lake 2011 online and in print, so bring it! Stats are coming We just need to clean up all the data and put it on the site. Should be much quicker than last year, so check back here. We had a blast this weekend on and around Lake Waccamaw. Months of hard work were all worth it after total participation of nearly 900 for the four Personal Endurance Challenges. We’re still recovering, ourselves, and will get to all the wrap-up stuff in a few days. So check back in here for participation stats and your times, even. Then check back in here in a few months so we can do it all over again! John McNeill with one of his masterpiece signs. Mile markers are up all around Lake Waccamaw and people everywhere are exercising and getting ready for Take the Lake, the simplest, yet toughest community event in the region. With 384 people pre-registered for the four Personal Endurance Challenges, organizers are getting ready for an exciting weekend. The events should be exciting to watch, so those not participating may visit the lake just to watch an expected 100 kayaks take off from the public beach at Dale’s Sunday morning, or more than 400 bicycles from Dale’s parking lot Sunday afternoon. The Walk/Run will start things off at 8 a.m. Saturday at the state park visitors center. Entries could exceed 400 people, and parking will be along the park road, so carpooling and arriving early are encouraged. Lake residents may wish to bicycle or get rides to the center. Check-in begins at 7:15 a.m.
As they enter and wait for the start, participants may wish to speak with Natalee Whitaker, the first Take the Lake “celebrity participant.” Whitaker was selected recently as a “fit mom” by a regional magazine for her successes with long-distance running and triathletic events while growing and raising a family. At the starting bell, runners will lead walkers out of the park, and head north on Bella Coola Road. Motorists are asked to use caution on Lake Shore Drive and Canal Cove Road between 9-11 a.m., as the route should be heavily congested. Organizers chose to save the 4.5-mile walk through the state park for the final leg of this event, rather than send more than 300 people straight onto the narrow wooded trail. Lake resident and community supporter John McNeill is scheduled to ring the starting bell at all four challenges, so participants will enjoy his cheer for every start, and then will receive the John A. McNeill Award at the finish of the Walk/Run, the Bike and Hike and the Paddle. Successful swimmers will receive the Lee J. Greer Award. Saturday evening brings a welcome break with an exciting concert at 6 p.m. as Nash Vegas takes the stage on the lakeside lawn of the N.C. Boys and Girls Homes across from Dale’s Restaurant. This band has a dedicated following in Dunn, and will share a blend of beach, pop, rock, R&B and top-40 favorites. Tickets for the concert are $10 adults and $5 for 12 and under. Sunday is a full day with morning and afternoon challenges. Organizers scheduled the paddle for 8 a.m., hoping for calmer waters, with check-in at 7:15. Nearly 80 people have signed up for this challenge, and more than 100 are expected, crowding the public beach with colorful kayaks and canoes. Parking will not be allowed at Dale’s front lot or the beach as participants unload their kayaks or canoes. Direction of travel for the paddlers will be determined that morning based on wind patterns. Civilian “Paddle Patrol” boaters will supplement and assist Lake Waccamaw firefighters, park rangers and sheriff’s deputies by cruising around the lake near the no-wake zone and watching for paddlers in distress. Boaters wishing to provide this valuable service may just do so at their leisure. This challenge will last 4-6 hours, and most paddlers will have returned as cyclists arrive for the Bike and Hike at 1:15 p.m. Sunday, getting ready for the 2 o’clock start. With 300-400 bicycles crowding Dale’s front lot, the start of the Bike & Hike should be exciting. At the bell, they will proceed down Canal Cove Road toward the dam, with the faster cyclists taking the lead. The town, the park and residents will have prepared the dam for easier passage, with a makeshift bridge over the river, and sandbags to aid in the short climb up the dam wall. Once in the park, cyclists will become hikers as they push their bikes along the beautiful, yet bumpy and sandy trails, hugging the shoreline until they reach the campground. New this year, park Superintendent Chris Helms has tried to make the “hike” portion shorter by allowing cyclists to ride bikes through the campground. The trail there is very sandy, though, so bikes will have to be pushed part of that way. Cyclists will be strongly urged to keep in the road and not damage the shoulders. Back on their bikes, the next obstacle is the construction site at Big Creek. The State Department of Transportation will barricade a right lane for cyclists. This lane will pass through most of the site up to Big Creek itself, which will have a single lane. A Lake Waccamaw Police officer will direct traffic over Big Creek. From there, it’s only a short three-mile ride back to Dale’s. Monday marks the traditional Labor Day Swim, which has been conducted since at least the 1940s. More than 50 swimmers are expected for the largest swim ever, and organizers will divide the route into two lanes. Swimmers with paddle-powered escorts will travel on the side closest to shore, and those with motorboat escorts will travel on the other side. The swim route will be denoted with large yellow balloons, and other boaters on the lake are encouraged to avoid the area and to use caution when near it between 8 a.m. and noon Monday. Volunteers are always needed, and helping out at a challenge or two is a great way for families to stay together at these events. 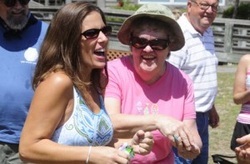 Volunteer coordinator Julie Stocks may be contacted at 646-3583 or on location. The event’s website, Takethelake.org offers last-minute instructions and what-to-pack lists. We have no rain plans for Take the Lake this year, because it looks very likely that skies will be clear all weekend. Come on out and enjoy this unique community fitness event with us! Committee member Eric Brandt presents the Take the Lake story to PPD employees recently, one of many talks he has given to promote Take the Lake in the region. It is hoped that an “extreme” type event involving all of the Take the Lake Personal Endurance Challenges may motivate people even more to realize their physical potential. Two aging members of the Take the Lake Committee will attempt to complete all four Personal Endurance Challenges in a single day Saturday (Aug. 28) so that someday, everyone else may have the same opportunity. The daylong endurance test, achieved in 2009 by 28-year-old Russell Smith of Whiteville, may become a separate event, called Take the Lake X-treme, if the committee can design it for the public. As planned, Brett Gore and Mark Gilchrist will begin at 6 a.m., completing the Bike & Hike first, then will swim shortly before 8 a.m. They will begin paddling just after noon, and will take on the Walk / Run after 5 p.m. Gore, 47, and Gilchrist, 50, with the help of their stellar support crew, hope to finish well before midnight. They will post their progress after every leg on Whiteville.com, in This Just In. After the Walk / Run Saturday, come back to the Lake for an exciting party Saturday night! Nash Vegas, a swingin’ party band has a large following in Dunn, and will share its blend of rock, country and shag dance music with us. The lawn of the Boys & Girls Homes near Dale’s will be packed with people enjoying the music. This concert will begin the SCC 2010 Richard F. Burkhart Performing Arts Series and will be just the festive time we’ll need to celebrate Take the Lake. Hundreds of people will have already completed the 15-mile Walk / Run, one of the hardest Personal Event Challenges of the TTL four. Even hundreds more will be ready to paddle 14 miles the next morning or Bike & Hike 15 miles Sunday afternoon. Some think that Take the Lake is too good to be true, and we think they’re right! Not only is it free to enter, but you get a nifty numbered “racing” bib to take home with you, and water and snacks to put in your belly. When you finish – and we know you’ll finish! – you will be handed an official 2010 Take the Lake John A. McNeill Award for the Walk / Run, the Bike & Hike or the Paddle. Here are the award tokens (front shown) for 2010. Swimmers, as usual, will receive the Lee J. Greer award, a gold coin donated by Colliers Jewelers. The official 2010 Take the Lake fundraiser t-shirts have arrived, and are available at Herald Office Systems next to The News Reporter in Whiteville. Those who prepaid for shirts may pick them up from Mark Gilchrist at The News Reporter. A very limited quantity of hats are available for $7, and about 100 oval bumper stickers are $1. 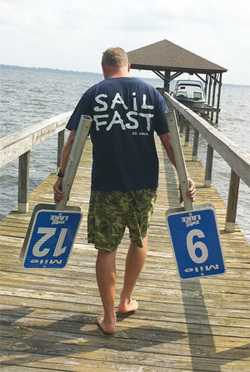 Brett Gore and his father, Jackson, had a heck of a time Saturday on Lake Waccamaw with a small crew mounting mile marker signs on 14 of the 126 or so no-wake poles around the lake. A project of Take the Lake, and funded by Columbus County Healthy Carolinians with a grant from the Kate B. Reynolds Charitable Trust, the 12″ x 18″ signs were made by DOT Enterprises to DOT specs. With a starting point near the Lake Waccamaw State Park visitors center, miles 1-10 match almost exactly with mile markers 1-10 soon to be erected on roadsides around the lake, running in a counter-clockwise direction. Miles 11-14 run along the the state park shoreline and approximately match miles 11-15 in the park. Soon, there won’t be a person in Columbus County who doesn’t know about Take the Lake, as Col. Cnty. Healthy Carolinians has provided two large banners promoting the fitness event. One is hanging in front of Columbus Regional HealthCare in Whiteville and the other stretches across the top floor of Dale’s at the lake. Both are Take the Lake sponsors, and both are proud to help people Take the Lake! Everyone is encouraged to pre-register ASAP at Takethelake.org and to train AHAP (as hard as possible) because the better shape you’re in, the better able you will be to Take the Lake! Well, not a lot of history to go by, but registrations for the 2010 Take the Lake have well surpassed those of 2009, perhaps because of the success of last year’s event, but also due to the realization people have that registering early has many benefits. Take the Lake is not just a walk in the park – although it includes a beautiful one – but it is four formidable Personal Endurance Challenges that require training and preparation. Even though online registration for Take the Lake is simple, painless and free, it is a significant psychological step and helps participants “officially” enter the training stage. Also, the 2010 Take the Lake T-shirts will be on sale soon. They will have green and black colors on athletic-gray cotton, and since they look similar to the 2009 shirts, and those sold out, we hope these will too! To secure yours, bring or mail a check for $10 each shirt to Mark, at The News Reporter, 127 W. Columbus St. or mail through P.O. Box 707 in Whiteville, NC 28482. If you haven’t registered, we hope you will today, and start training for the achievement of your lifetime! The runner-up “fit mom” in a regional parenting publication will take first place in the eyes of mothers around Columbus County as she inspires them in their preparation for Take the Lake next month. Natalee Whittington Whitaker, a Southeastern Community College and UNC-Wilmington graduate living in Greenville, will be the first “celebrity participant” for the annual Labor Day weekend of fitness called Take the Lake. Whitaker will return to her home-place Labor Day weekend, appearing at the state park Visitors Center Saturday, Sept. 4 with her family at the opening of the three-day event to send off her husband Kevin on the Walk/Run. She will spend time there to discuss with participants challenges and tips for raising a fit family. Whitaker will participate in the Bike & Hike Sunday and the swim Monday, joining Kevin, who will also accept the paddle challenge. So, with the moral support of their children and parents, Rita Capps and Gary Whittington of Whiteville, “Team Whitaker” has accepted and intends to complete all four Take the Lake Personal Endurance Challenges. Along with the daily chores of managing a family, Whitaker, a wife and mother of two, has found her own inspiration in exercise. “This is my sanity,” she said, “Instead of going shopping, I train. Everyone has to release stress and anxiety at times, and cycling, running, swimming or just exercising helps me do that.” She can’t always be with her children while she exercises, but she understands that fitness for one makes better health for all. So she tells her children, “I owe it to you all to take better care of myself.” And they will soon understand that caring for their own fitness and health will help their own families grow strong. Whitaker gets her greatest motivation when she can find a way to “set a goal and step outside of my comfort zone,” she said. The Bike & Hike should be easy for her, but she’s looking forward to Labor Day, when she will attempt to swim the longest distance of her life. Whitaker also finds strength in Kevin, an N.C. Guardsman. “We motivate each other,” she said. For the Whitaker’s efforts, Kevin will receive two John A. McNeill awards, while Natalee will receive one JAMA for the Bike & Hike and one Lee J. Greer award for the swim. The JAMA is a custom-made resin token donated by the McNeill family, and the Lee J. Greer award is a gold coin that Colliers Jewelers has donated to swimmers for decades. An expansion of the Labor Day Swim and the newer Walk/Run around Lake Waccamaw, Take the Lake is in its second official year, and organizers hope to double last year’s participation of more than 400 people completing more than 500 challenges. Early registration is encouraged at Takethelake.org. Whitaker, who was recognized in the Eastern Carolina Parent magazine’s second annual Fit Mom contest, is far from being a full-time athlete, exercising as little as three times a week for a half hour. Some days she’ll burn up an hour or more, and in triathlon season she’ll train up to six days a week, but it’s a flexible schedule that often includes her family. “It’s fun to get out there and exercise together,” she said. In a few years, the Whitaker children may take on a Personal Endurance Challenge or two, and Noah, 5, ran in his first race recently. It was only one mile, but it took Noah much further, from an anxious contender to an excited and successful participant. “After the race, he told me ‘I was so nervous before, but I want to do another one next weekend!’” Natalee said. It’s the confidence of success that brings with it a healthier son and a healthier family, and as a fit mom, for Natalee Whitaker that is a first-place finish for the greatest success of all. This article originally appeared in the August 5, 2010 edition of The News Reporter. 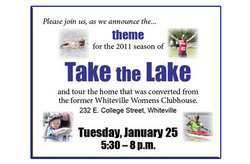 The 2009 Take the Lake T-shirts were so popular, we sold out early and had to order seconds. Not sure we can do that this year, but you can make sure you get yours – and save a few bucks while you’re at it! - We’re not sure of the colors or design yet, but if you think they’re ugly, we’ll give you your money right back. Mark Gilchrist, left, a Take the Lake organizer and SCC Presents host Sue Hawks discuss the Labor Day Weekend event. Sue Hawks and the crew from SCC Presents, the cable television show of Southeastern Community College, have obliged us again with a Take the Lake promotional episode, which they taped July 21 on the shore of Lake Waccamaw. We discussed everything that is new about the event this year, and reviewed each Personal Endurance Challenge – it’s a Must-Not-Miss for anyone considering Take the Lake. The half-hour show should be broadcast soon, so check your listings and don’t miss SCC Presents. Also on the program were Julie Stocks and Olivia Lake Stocks, who introduced the Saturday evening concert. I’ve told many people in the past year that the most difficult step in “taking the lake” isn’t made on Labor Day weekend – it’s the great step you take when you first commit to one or more Personal Endurance Challenges. That’s the step when people simply stop letting themselves believe that they cannot achieve one of the four PECs of Take the Lake, and they resolve that they can. It comes when they stop believing that fitness is something they don’t need, and they see how vital it is, not only for a longer life, but for their quality of life. That is the biggest step of all, I tell people, and the rest is easy. But enough of my talk – let’s hear the voices of participants in last year’s Take the Lake. Of the people who took a survey following the 2009 Take the Lake, more than nine out of 10 participants in the Walk / Run had never walked that far before, encouraging news to anyone with doubts. About two out of three of the cyclists, and four out of every five paddlers and swimmers surpassed any limit they’d ever had. When asked what drove them to train for and participate in Take the Lake despite their lack of experience, overwhelmingly most people answered “sheer determination,” giving us insight into what drives us to succeed. Many participants said they would accept more PECs next time, which we took to mean that their success last year compelled them to achieve even greater feats. Not sure if you have the right gear? Our cyclists and kayakers can help you. More than half of the cyclists in 2009 rode mountain bikes, and about a third rode beach cruisers or “old clunkers,” while very few rode racing bikes. The largest group of paddlers sat in plastic kayaks, while only about a third used “fast, expensive” kayaks. Very few used canoes or the ocean kayaks that you sit on top of. Regarding the “hike” part of the Bike & Hike, about 80 percent said it was anywhere from “tough, but good” to “awesome,” so we’ll keep that PEC. People have offered many alternatives to the stroll along the park trails, everything from ferrying 500 bicycles on trailers or boats between the park and the dam, to paving the trail, to just giving up on the whole “take” part of Take the Lake and riding back and forth on the roads. We’ll keep it like it is. Thinking of swimming the lake and are you wondering which stroke to use? About half the people who responded to our survey said they used “whatever works,” while nearly that many swam freestyle the entire four miles. Only one person did the backstroke. Speaking of the swim, we are introducing the Silver Swim Relay for Labor Day Swim veterans age 55 and older. We piloted this last year and are making it an official event to encourage our senior swimmers to stay in the water for one of the healthiest exercises going. Colliers Jewelry in Whiteville is donating silver coin medallions like the gold ones they have given to swimmers for decades. The Silver Swim Relay is the only relay allowed, so please don’t start planning a bike, walk or paddle relay – at least not during Take the Lake. We asked for suggestions to anyone considering a PEC, and we got great comments like “Believe in yourself!” and “Do it!” Others suggested enlisting friends to join you. Take the Lake is still a free event. 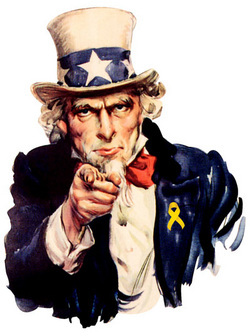 We’re not asking you to raise money for a charity and we’re not asking you to join a race. All we ask is that you take it seriously, and that you register early and train accordingly. Certainly, most people can accomplish a PEC without training – and that can make for some odd kind of bragging rights – but you will accomplish it faster, better and with less chance of injury if you train. The real goal of Take the Lake is to give people a “higher mountain to climb,” or an achievement to make them feel proud. If you can do one PEC without effort, then maybe you could try two, or three, or try to complete them even faster. Take the Lake is the brass ring for which you will strive for your best, strongest, healthiest and most powerful you. About one-third of our respondents said they would consider an event held on a separate day that includes all four PECs, so we’re pretty psyched about organizing a pilot “Take the Lake Extreme” event this year and maybe introducing it officially next year. Before you begin a PEC, we’ll register you and give you a numbered bib to pin to your shirt, and when you finish, we’ll let you know how fast you completed the PEC and we’ll give you a memento of your success. When you complete the Walk / Run, the Bike & Hike or the paddle, the McNeill family will present you with a John A. McNeill Award, and for the swim, Colliers Jewelers will present you with their Lee J. Greer Award. And we hope at that point, you will take the first, big step toward next year, and your fitness for the rest of your life.